Work directly with material onto the plate with either soft ground or ink to leave impressions – suggested materials include bubble wrap, feathers, leaves, lace, open grain fabric, ribbon. By the end of the workshop, you will have a deeper understanding of the technical processes involved in etching. You will have created prints from a number of sample plates using different resists. These plates can be used in future for further prints or as a development for artwork. Bring ideas! Bring sketches or images that you would like to use as references. Materials, the tutor will have some materials to use but you might like to bring your own. These should be solid enough to make impressions, such as lace, plastic open weave netting (on bags of fruit), woody dried plants, thin cord or string, corrugated card, bubble wrap. Printmaking is messy so bring an apron or old shirt to protect your clothes. 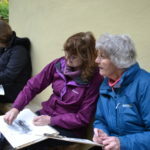 Her interest in Printmaking developed at Kendal College whilst completing a Foundation Degree in Drawing with the University of Cumbria. She finds the quality of marks made in the process of printmaking particularly fascinating and has produced prints using a variety of techniques.